I love watching this one go up, the garage is winding around like a corkscrew and they are coming up on level five. On a side note, the first retail store is about to open on the ground level of the newly opened garage. It is an Ascension coffee house or concept of some kind. The interior is finished out so it should be open almost anytime. Check out the quick Paint rendering of the Amli tower in the Dallas skyline through the Flickr account above made by me. I am not sure how to post the pic on the thread.. sorry! Thanks for sharing that, looks great! Almost looks like a rift has grown between the core CBD and uptown "Victory Park", would love to see more new activity replace some of those surface lots! Ascension will open May 7th, as the tower goes up you are starting to get a sense of how the fountain area will feel between these two buildings. Working on level 5 of garage..
halfway up there to the rotation of the tower. "Fountain Place Residences sits atop a nine-story parking podium whose 192’ square footprint equals that of the office tower. At the 10th story, the tower rotates 45 degrees to maximize views of Uptown and Santiago Calatrava’s Margaret Hunt Hill Bridge from the residential units. Densely planted with trees, an 18,000 SF roof deck at the 10th floor offers a park-like setting where residents can experience the city and the sky while entertaining or relaxing in outdoor kitchens, cabanas or greenspace. " Tried out the coffee shop today. Nice setting, the name is Ascension Annex. Almost 370 units, will be amazing to see what kind of an impact this building will have on the surrounding area. This side of the freeway is still kind of a residential deadzone. Can help but wonder how the residents here will interact with the urban fabric. 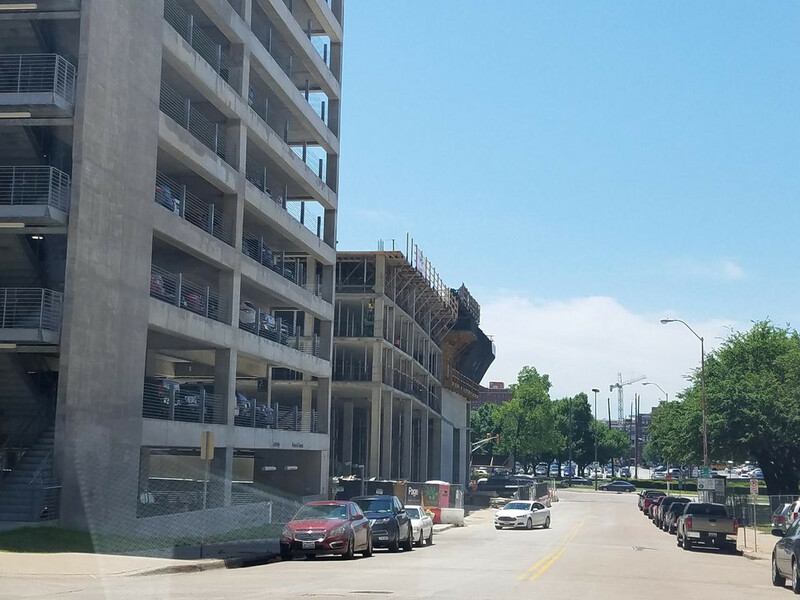 Will they just drive out of the parking garage straight up to Mckinney to buy their groceries or will some of them walk to the future grocery store at The Union? 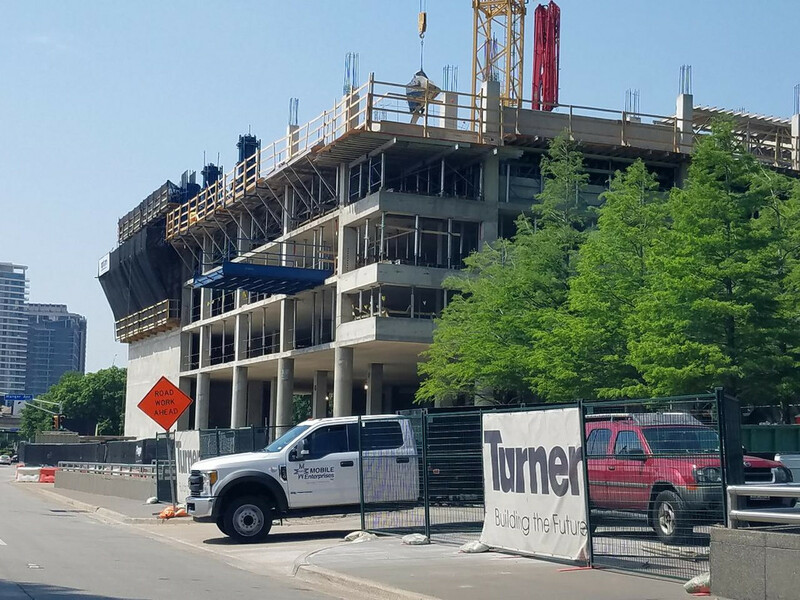 The neighborhood attractions for these units would be Kylde Warren, Perot, El Fenix, 7Eleven, Village Burger Bar, La Ventana, Meso Maya, T Boones Pickens YMCA, DMA, Stampede 66, Starbucks Ross Tower, Dakota's and The Union with Tom Thumb. The giant parking lots to the south-west towards the West End make it an unattractive and hostel walking environment. Course if you can afford to live to here you are at minimum ordering Uber to go to any of these places anyway. I checked out the Ascension Annex yesterday. The plaza at Fountain Place is really chill. Looking forward to the activity once AMLI finishes and more restaurants/retail move in. Also hoping the "nub" to the garage facing Ross gets built. ArtVandelay wrote: I checked out the Ascension Annex yesterday. The plaza at Fountain Place is really chill. Looking forward to the activity once AMLI finishes and more restaurants/retail move in. Also hoping the "nub" to the garage facing Ross gets built. Any sign of them finishing the garage? 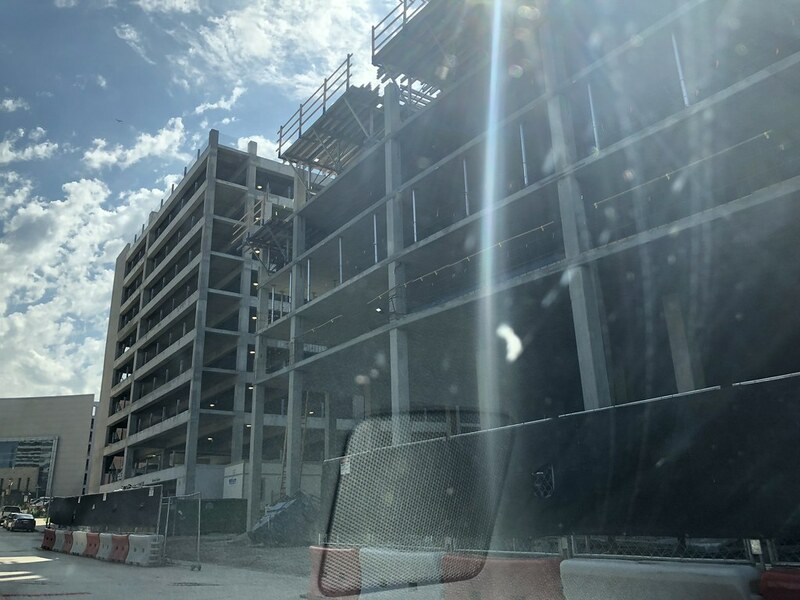 I walked through this area last Sunday and it really is going to be a great place once the garage and apartment tower are finished. It was fun to see the old fountains running again as this was always a cool hangout in the summer back in the 1980's when it opened. All very promising. Good reviews of this very beginnings of this addition only makes me wonder when the Headington corners will turn. I’ve heard some disappointing rumors from FP building operations folks that the plan is to only cover two sides of the garage with glass: the side facing FP and the side facing Ross. Last I looked, only one glass panel is on the garage at this time. dukemeredith wrote: I’ve heard some disappointing rumors from FP building operations folks that the plan is to only cover two sides of the garage with glass: the side facing FP and the side facing Ross. Why is this disappointing? The back of the garage is on Freeman which is really just an alley, and once AMLI is completed you probably will not be able to see the garage. And that one glass panel has been up for awhile, presumably a mock-up to facilitate selecting the right colors, etc. I would think they would at least do three sides to include Munger, that's going to look right at the Hillwood tower. And the renderings on the ground level retail windows still show the "nub" so maybe it's a late stage addition. Tnexster wrote: I would think they would at least do three sides to include Munger, that's going to look right at the Hillwood tower. And the renderings on the ground level retail windows still show the "nub" so maybe it's a late stage addition. That's what I would have expected as well. I mean seriously, it's not a huge chunk of the garage, just one end. Why not complete that side? Agreed, would make for a perfect 2 story CVS/Wallgreens and Gym above. I bet they wanted to throw in some coworking outfit in the upper floors of the nub with a landmark restaurant on the ground floor. The problem is coworking is seeing varied success in various parts of Downtown. A lot of people threw their hats in the ring and it's in a rebalancing act right now. Many independent coworking spots have closed and the chain coworking outfits like WeWork are still not stable business models with proven profits. They have dressed up the concept of executive suites with leasing agents labeled as "community specialists". Most of these office buildings are simply using the label "coworking" to apply to lounges they are creating in their buildings as a tenant amenities. Absolutely. I'd love to see an urban Planet Fitness here to compete with 24 Hour Fitness. With the YMCA is right across the street, and presuming the AMLI residential tower will have a tenant gym, who would use either a Planet Fitness or a 24 Hour Fitness? Planet Fitness isn't exactly a high-end tenant so I doubt that exact tenant would find a home in a tower trying for A class tenants plus the rent would be too high. Planet Fitness would work better going in other neighborhoods surrounding the CBD but I doubt their true market is in the CBD. cowboyeagle05 wrote: Planet Fitness isn't exactly a high-end tenant so I doubt that exact tenant would find a home in a tower trying for A class tenants plus the rent would be too high. Planet Fitness would work better going in other neighborhoods surrounding the CBD but I doubt their true market is in the CBD. Planet Fitness is on the lower end of gyms, but you will find 24 Hour Fitness in some upscale locations. I would love to see the Harwood 24 Hour move here. The Harwood location is a disgrace. Dark, dank, rundown and filthy. You would think the downtown location would be nice, but it’s one of the worst in the metroplex. Thanks for your preview renderings of this new building in the skyline. Another interesting angle will be coming south on Central. 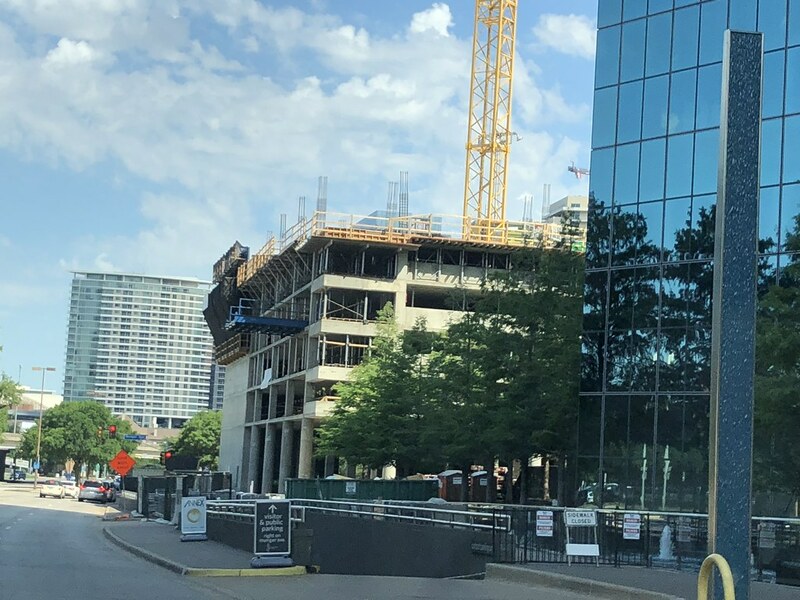 After passing under the Fitzhugh bridge there should be a good view of Fountain Place and the new building to the left of the much maligned Richards Group building. Last edited by Redblock on 11 May 2018 10:29, edited 1 time in total. My statement still stands Planet FItness is not the kind of tenant Fountain Place wants. Just because you saw one in Manhattan doesn't change the fact that it is perceived as a lower end tenant and the last thing Fountain Place wants to mess with is perception. They are pushing a luxury brand for the whole site and Planet Fitness does not fit that scope. Thanks for your preview renderings of this new building in the skyline. Another interesting angle will be coming south on Central. After passing under the Fitzhugh bridge there should be a good view of Fountain Place and the new building to the left of the much maligned Richard's Group building. ...maybe Roman_Patrick will be curious about that view from Central! This is the best picture i could find.. not necessarily from the highway.. but close! Making progress as they are setting the floor for the sixth level. When I walked over to take a look today I took a hard look at the rendering on the glass of the empty retail space. I was looking specifically at the garage since we had the discussion about glass coverage this week. Based on what I saw the rumors are true and in fact they don't even intend to fully cover the garage on the north side of this tower since most of it appears to be open with just a frame around the edges of the garage. So, there is a giant gaping hole on the new tower that isn't covered with the garage completely exposed. 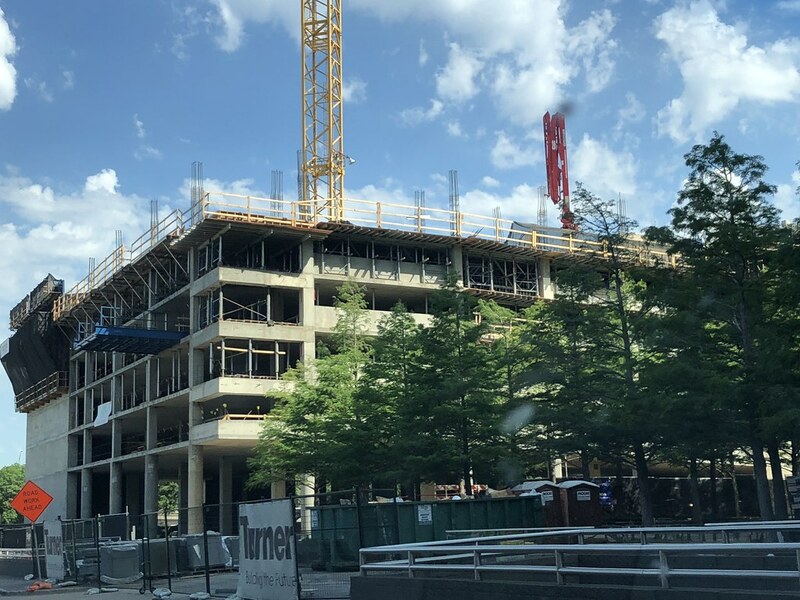 The new garage next to it has no glass on the north side and to be honest it only appears that they intend to cover the garage facing the plaza and not the entire western side, once it goes behind the new tower it looks like thats where the glass will end. I know Fountain Place doesn’t have any, but has there been any mention of the Amli having any night time lighting? DallasAg wrote: I know Fountain Place doesn’t have any, but has there been any mention of the Amli having any night time lighting? I hope they don't do that on this tower. They are setting the floor for the 7th level of the parking structure this week. Thanks as always, salivating at the idea of having 40 stories going up here. 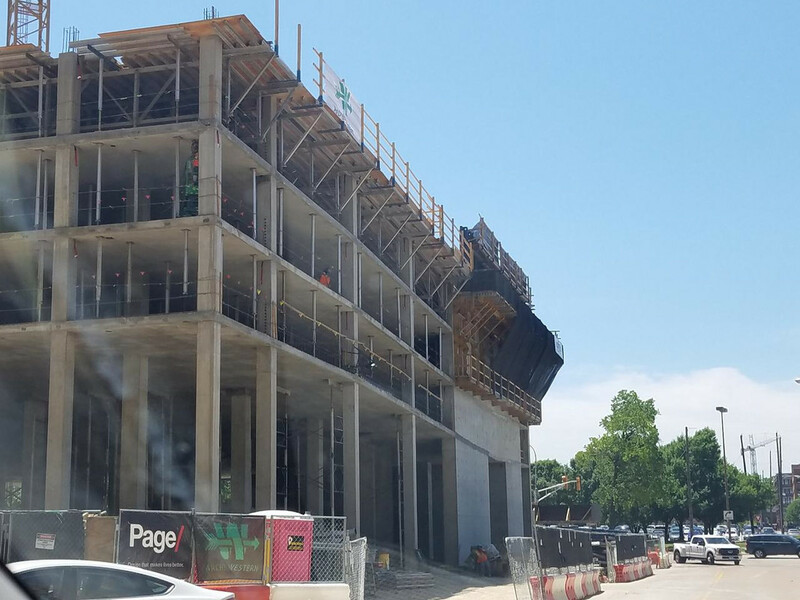 If the Perot and Asian Museum site ever get moving, this will be a critical piece of infill between the CBD and uptown. And to only imagine that a walk way extension from KWP to the Perot Museum is also on the table. Would love to see this version of the "Dallas Highline" take place. You mean the glorified highway overpass they would put lipstick on...It's no different than what they built over LBJ to connect both sides except this one will have a few plants on it. The Highline is the Highline because it was an abandoned railway through very urban areas of New York city. Building a concrete overpass ramp for pedestrians is just that, a glorified concrete overpass for pedestrians that has no real need. It will have none of the charms of the Highline. Klyde Warren is our Highline. A suspended park over a freeway that re-connected two areas of town. It is something unique. The Katy Trail is basically our Highline as well. Turning something we already had into something beautifully functional and desired. Um they have plans in NYC to add new extensions off the high line that will be built as new. Still can be cool just becuase it is not repurposed. Building a few segments off of the original Highline is very different from what they plan on building here. There is some very unique architecture being used to extend the Highline in New York. Here in Dallas they clearly show building a standard issue concrete overpass with some decking and a few plants, IF that even makes it into the final designs approved by TXDOT to allow such amenities floating over the highway. When has Dallas copied things like the Highline ever turned out as pretty as the original? We as a city cost savings projects like this and miss the point entirely. Just because the Klyde Warren Park Foundation is steering the ship is no saving grace here. The Highline was based on using some existing infrastructure for a greater good and it happened to work beautifully same thing with Katy Trail. Yet here we are chasing a bad Highline copycat like it will be a modern marvel of engineering and design. I read somewhere that this tower is to have a light up crown..
i am looking for the information, will post once and if found. i am looking forward to some kind of lights on this tower, the top diamond portion would be incredible! found this on the proposal doc. Current Marking/Lighting Other Description:	"
Oooooo, gimme something like Luxor shooting out of the top. That would be SWEET, mainly because I think it would be ready gaudy and hilarious. The LTV/Crow tower had similar lighting. Much better in theory than in practice. Unless the weather was foggy or misty it wasn't very visible. Our air is too clean. I am sure Love Field is the biggest problem now. While Love Field already existed back when we used to have major up-lighting I doubt today the FAA would allow it. Starting to work on the 8th floor of the garage, should be close to starting the residential portion soon. Very exciting. I can't wait to see this start to show on the skyline. R1070 wrote: Very exciting. I can't wait to see this start to show on the skyline.